In our very first instalment of the PaddleSurf.ca Shop Profile, we chat with Bob Putnam of Deep Cove Kayak in North Vancouver. Deep Cove Kayak has been a fixture on the shores of Deep Cove for many years now. Every single day of the good weather months you’ll see dozens upon dozens of kayaks paddling around Indian Arm, most of them rented from their facility located right on the shores of the Cove. 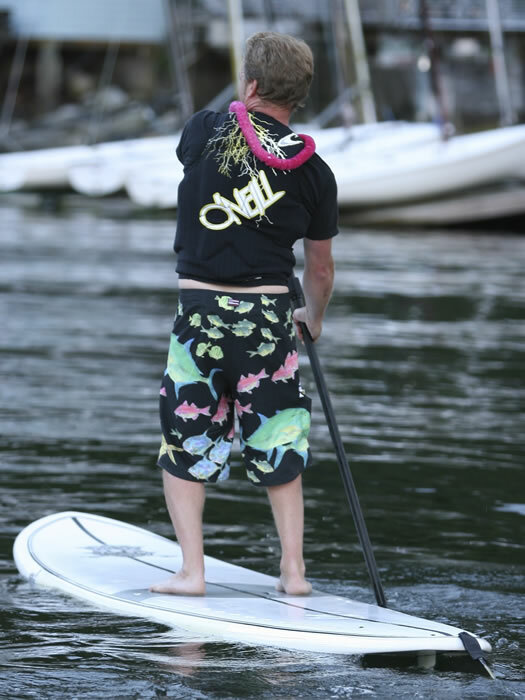 Deep Cove was one of, if not the first to offer Stand Up Paddleboards rentals in the Lower Mainland, and they’ve seen some incredible growth in the segment over the past year. So with that, here’s what Bob has to say about the shop, the sport, where to do it and where it’s going! Our rental operation has been in business for 29 years, our retail operation for only 6 years. We always sold our rental kayaks at the end of the season so it made sense to start selling new kayaks and now SUP in retail operation. We originally operated out of a warehouse near MEC in North Vancouver, then moved to the old Cove Bike location in Deep Cove. This building has been sold, so we are moving back to the warehouse for Nov 1 2010. We are looking forward to this as we will be more centrally located and its kind of a no nonsense gritty location. 3,200 SF of space so we will have retail, rentals boat/board repair. About 4 or 5 years ago, Jeff Teachman, who now teaches at Windsure at Jericho, came into our store looking for castaway paddle parts to make a SUP paddle. When he told me what that he wanted to stand up and paddle a surf board, I thought, “Sounds kinda dumb, maybe in Hawaii but who would want to do that in Vancouver?” How wrong I was. Jeff was always visionary. Two years ago we started selling Starboard. We also sell other paddle sports equipment like kayaks and surf skis which is similar… but different. We have a lot of knowledge in “sport and performance” paddling. Racing, adventure paddling. So pushing the limits is what we like to do and to supply gear that will help people do that. 2010 has seen very good growth. More and more people are coming in and asking about SUP so I think it will explode next year. Starboard K15, Whopper and the Big Easy. They are manufactured in Thailand’s Cobra Factory which sets the bar for composite construction. Necky Kayaks and many others are moving their production to the Cobra Factory. Because we are located near flatwater we are pushing the efficiency of the flatwater boards. Many new SUPers will only paddle on flatwater so it doesn’t make sense to get a slow surfy board. You will soon see people have 2 – 3 boards as the sport grows. Werner has been making top quality paddle for so long that making an SUP is a no brainer. They already have the blade shapes from Outrigger and are designing new shapes specific for SUP. They are expensive but the quality is excellent. Because the shaft is so long it is difficult to make a paddle that is strong but still remains light and has a good swing weight. Many of the board manufacturers are producing paddles, but I haven’t seen any that compare to Werner. They make the best kayak paddles too. I have looked at Kialoa and we will stock those for 2011. Clothing, for SUP surfing you don’t need the same thickness of wetsuit that the sit in water surfers need. We have some great pants by NRS and tops by O’Neil that allow for good movement and that you don’t over heat in, as you would in a 4/5 ml steamer suit. As winter approaches paddlers will be looking at how to extend their season. Although we are finding that the sport is very solar driven, and many SUPers are fair weather only. Drysuits are really comfortable to paddling in. Easy to put on and take off. Nice and cozy. Leash, PFD and Whistle. OK that’s 3 but if you call it safety gear it could be one. Much of the imagery for SUP comes from Hawaii and the tropics where the water is warm. Here in Vancouver its pretty cold and hypothermia is an issue. Cold water shock and Cold water Incapacitation are serious threats to safety. Many SUPers are naively resistant to PFD’s and other safety gear. They are comfortable and will save your life. Well working at Deep Cove Outdoors we get to hear about new equipment, events, techniques. So by coming into the store you can learn about these things too. We also offer board repair and lessons. Mike Darbyshire is one of our main SUP instructors. He is a great surfer but also brings knowledge from the kayaking world, You can also stay in touch with news and events through our Deep Cove Outdoors Face book page and our Deep Cove Kayak Page. I also write a blog which features Stand Up, Surf Ski, Cross Country Ski and Kayaking info. Deep Cove and Indian Arm is where many people come to paddle. The scenery is incredible and its really close to Vancouver. Indian Arm is about 3 – 4 km wide so you can head off in a variety of directions. The south part is dotted with about 6 small islands, so every visit can be different. Twin Island is a beautiful destination, about 10 km round trip. You can have lunch on Twin and there is a beautiful lagoon between the two islands. Well if you like flatwater the morning is best. If you like surfing, weekend afternoons sees lots of big power boats creating boat wake. In the afternoon on a sunny day the wind blows up the Arm fairly predictably, so its good to paddle south and then surf back. Ambleside beach in West Vancouver is a great spot to paddle. A NW or Westerly brings in some nice wave action. A good downwinder is to put in near Lighthouse Park and Paddle to Ambleside. Also on the new and full moons there are big currents which create standing-ish waves. Although it might be very challenging for most SUPers. Racing: We also organize weekly races on Tuesday Nights. The Tuesday Night Race Series has been going on for 12 years for kayak, surf skis etc. This past year there has been good attendance from SUPers and we hope to grow it for 2011. Starts in April and runs till Sept. Nuclear!! I think SUP will do to surfing what snowboarding did to skiing and full suspension did to MTB. SUP allows the average joe so much more opportunity to surf, whereas traditional boards are just plain hard. If you are not surfing it is a great work-out. What’s your favourite part about being involved with stand up paddleboarding? I like seeing people stoked on a new activity. I like meeting people who are going through the same experience as I am. I like it when somebody comes into my store to say thanks to us for informing them about a piece of equipment, clothing, technique, or event….and it happens often. I would suggest to take a lesson. Many people will say that its not hard and why take a lesson. But that’s not true. These people either don’t know what they know or don’t know what they don’t know. Forward stroke is the least taught and most used stroke and will help the paddler get more performance, efficiency and a better work-out. Safety: If you don’t know what the hazards are you can’t prepare for them. How many paddler’s have some sort of communication with them? Surf Etiquette: This I need to learn, but SUPers need to know how not to piss off regular surfers by cherry picking waves etc. When buying gear try to figure out they type of paddling you will mostly do. For instance, don’t buy a surf specific board if you only go to Tofino once a year. Deep Cove Outdoors will be relocating to 352 Lynn Avenue for Nov 1 2010. For the 2011 season we will be carrying a wider range of brand name boards, paddles and accessories. Deep Cove Outdoors is in a unique position of owning and operating our water front facility of Deep Cove Canoe & Kayak Centre. So, we have a qualified instructional team, a full rental fleet, and we host lots of fun events. We like to offer a full complement of services. For instance, if you want to start SUP, we can advise on equipment, suggest rentals that will help you develop basic skills, refer you to lesson programs, you can test boards, organize events, provide you with a great price on a board, fix it when you break it and organize an outing for your company or friends. Thanks kindly to Bob Putnam for taking part in our very first PaddleSurf.ca Shop Profile, and if you operate a Canadian shop or business that’s involved with Stand Up Paddleboarding, please be sure to get in touch with us for consideration in participating in the Shop Profile program here on PaddleSurf.ca!